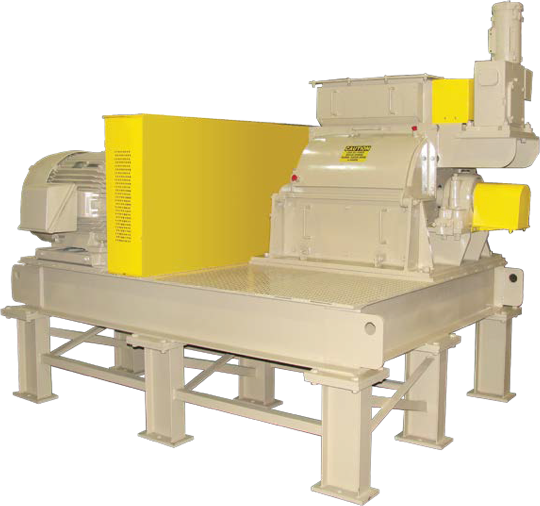 The premier equipment line of Jordan Reduction Solutions is our Hog Mill Industrial Grinders. No other grinder on the market has the versatility of application and ruggedness of design as do these reliable and dependable units. Many installations of these grinders are still in operation after over 50 years from original start up and continue to perform at an exceptional capacity. Suited for both wet and dry grinding applications, the JRS Hog Mill Grinder is the perfect choice when demands are somewhat complex in nature. These units continue to serve in applications from organics grinding, rubber grinding and even into ordinance and energetic material (explosive) applications. With a unique feed system, the Jordan Reduction Solutions Rubber Grinder has been servicing the rubber industry for decades. Our specialized rubber bale feeder, located in the throat of the unit can take whole rubber bales and reduce them to as small 1/4″ or below with out without a screen assist (material dependent). Additionally, the rubber bale design reduces the amount of recycle time in the chamber giving greater through-put with minimal horsepower requirements. These grinders also integrate either the ability for a fluid or dry powder partioning agent to enhance the grinding operation and help prevent agglomeration of the ground product. Designed for high-speed and high-inertia operation, these industrial grinders can power through multiple materials with significantly lower required running horse power ratings yielding and higher production capacities at lower operational costs. Rotors are cast in carbon steel or stainless steel, depending on the application requirements and are a closed-rotor design which is ideal for reducing large heavy infeed materials down to a particle size of 1/8″ to 3/8”. Please note, the capacities shown in the chart below are for hardwood through a 1″ screen. We stock a complete inventory of our OEM Hog Knives, knife clamps, and high-strength bolts. Additional replacements parts include throat bars, throat plates, and most screen. We also offer on-site or in-house service and maintenance on all JRS machine and installation of our replacement parts. Learn more about our Parts and Service Department. Please have your machine model number and serial number when calling or inquiring about replacement parts. 28" 50" 66" 66" 75" 75" 95"
32" 42" 42" 53" 53" 53" 53"
28" 39.5" 39.5" 44" 54" 54" 44"
10"x11" 15"x18" 15"x27" 20"x27" 20"x36" 20"x45" 20"x54"
13.5"x20.5" 22"x25" 25"x31" 30"x31" 30"x40" 30"x49" 30"x58"
20" 26" 26" 30" 30" 30" 30"
2 7/16" 2 15/16" 3 15/16" 3 15/16" 3 15/16" 3 15/16" 3 15/16" - 4 7/16"
20.625" 26.625" 26.625" 30.625" 30.625" 30.625" 30.625"